A leading scholar of Mexican immigration, who is also the owner of the world’s largest private collection of Latino art, is making a rare visit to Syracuse University. Gilberto Cárdenas, professor of sociology and executive director of the Notre Dame Center for Arts and Culture, will discuss “Visualizing Mexican Migration: Historical Context and Contemporary Flows” on Thursday, Dec. 1, at 4 p.m. at La Casita Cultural Center (109 Otisco St., Syracuse). The multimedia event, which is followed by a reception, is free and open to the public. For more information, call La Casita at 315.443.2151. Cárdenas’ presentation is sponsored by the Moynihan Institute of Global Affairs in the Maxwell School, as well as the Latino-Latin American Studies Program and La Casita, both in A&S. Earlier in the day at noon, Cárdenas will participate in “The Spanish Table,” in which attendees practice their Spanish conversation and learn about Latin American and Caribbean culture. From 12:30-2 p.m., he will deliver a lecture titled “Art and Mexican Migration.” Both events take place in 341 Eggers, and are free and open to the public. Cárdenas also will visit classes taught by Myrna García Calderón, associate professor of Spanish in A&S, and Rafael Fernández de Castro Medina, professor of public administration and international affairs in Maxwell. Cárdenas understands the tension between art and politics—something he has studied for more than 40 years. In that time, he has quarterbacked a series of scholarly projects focusing on immigration; race and ethnic relations; and historical, comparative and visual sociology. They have spawned four major books, including “La Causa: Civil Rights and the Quest for Equality in the Midwest” (Arte Público Press, 2004), which he co-edited, and dozens of related monographs, articles and chapters. 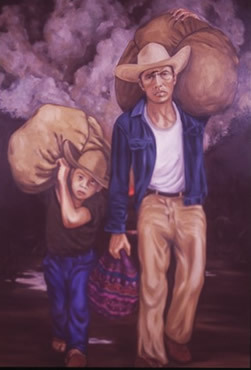 Cárdenas’ private collection includes this painting by Sam Coronado. The East Los Angeles native also boasts the world’s largest private collection of Latino art. His interest in collecting and exhibiting art took hold in the late ’60s, against the background of the heated Chicano Movement. Cárdenas’ passion eventually grew to encompass photography, and continued unabated during graduate studies at Notre Dame and early faculty appointments at Colorado College, the University of Michigan and the University of California, Berkeley. 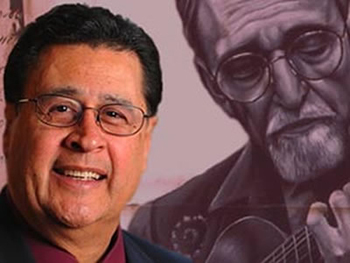 It was during a 24-year stint at the University of Texas at Austin that Cárdenas established and owned Galería sin Fronteras Inc., a commercial art gallery dedicated solely to Chicano (Mexican-American) and Latino artists. He also founded and served as executive producer of National Public Radio’s “Latino U.S.A.,” currently the longest-running Latino-focused program on U.S. public media. Since 1999, Cárdenas has occupied multiple positions at Notre Dame. Prior to taking over the Notre Dame Center for Arts and Culture in 2012, he served as founding director of the university’s Institute for Latino Studies and as Notre Dame’s assistant provost. He also has held the Julian Samora Chair in Latino Studies, and is a full sociology professor. Cárdenas has spent the past 20 years overseeing the Inter-University Program for Latino Research, a national consortium of 25 member centers and institutes. He has been thrice-named to the Hispanic Business magazine’s “100 Most Influential Hispanics” list, and has been twice-appointed to serve on U.S. Presidential Commissions.